A quick view of the most influential metrics in Rancho Bernardo. The master-planned community of Rancho Bernardo is located in the northern hills of San Diego in San Diego, California. The community spans 7,000 acres and has a population of more than 45,000. The community is approximately 20 miles from downtown San Diego and features power lines that are buried to preserve the beauty of the area. The neighborhoods are organized golf course areas together, senior living areas together and family areas together and each neighborhood features private parks and clubs exclusive to that neighborhood. The nearest neighbors to Rancho Bernardo are the communities of 4S Ranch and Carmel Mountain Ranch. The first inhabitants to the area were people of the Kumeyaay tribes. The first Europeans to the area were sailing for the Spanish crown in 1769. The area was controlled by Spain until Mexico won their independence from Spain and the area that would one day be the master-planned community was part of the Rancho San Bernardo land grant in 1842. The Bernardo Winery, one of the oldest operating wineries in California, was founded in 1889. In October of 2007, the area suffered through a wildfire, now known as the Witch Creek Fire. The fire caused paths of destruction through the community destroying several neighborhoods including Westwood, Montelena and Trails. This master-planned community provides luxury living with all of your needs met right in the community. Within the community's 685 acre business park is companies such as Hewlett-Packard, Nokia, BAE Systems Northrop Grumman and others. The community is home of the Corporate Headquarters of the Sony Corporation. Together the local companies employ approximately 50,000 people. Tourism also plays a large part in the local economy with the golf clubs, Bernardo Winery, fine restaurants, quaint galleries and unique shops. The community annually hosts a carnival-type street fair known as RB Alive! which draws visitors from miles around. 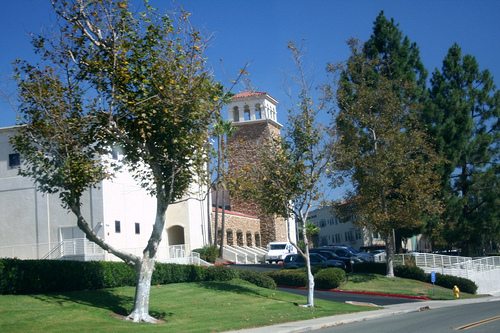 The educational needs of Rancho Bernardo are met by the Poway Unified School District and community is home to a group of private schools, the Marantha Christian Schools. This master-planned community provides luxury living with all of your needs met right in the community. There is the Rancho Bernardo Inn, which is open to the public and features an 18 hole golf course, tennis courts, a wonderful spa and fine dining. Other golf courses are two private courses, The Country Club of Rancho Bernardo and Bernardo Heights Golf Club and Oaks North, which is an executive course. The community features single family homes, senior living structures, condominiums, luxury apartments and more. For assistance in finding the home of your dreams in the stunning community of Rancho Bernardo contact local real estate agents. View our selection of available properties in the Rancho Bernardo area. Check out the latest demographic information available for Rancho Bernardo. Learn more about schools near Rancho Bernardo complete with ratings and contact information. Browse through the top rated businesses in the most popular categories Rancho Bernardo has to offer.